Ms. Sumita Dawra is an Indian Administrative Service (IAS) officer of Andhra Pradesh cadre and has experience of more than two decades in public administration and worked extensively at all levels of governance in India. She was posted in China (2011-2014) as the head of the economic wing in the Indian Embassy, Beijing. She authored the bestselling book on public policy, Poor but Spirited in Karimnagar: Field Notes of a Civil Servant, published by Harper Collins (India: 2012). 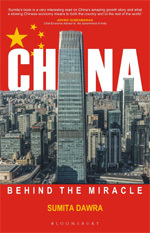 ‘China: Behind the Miracle’ is an easy-to-read, comprehensive account of the economic story of China. It explains various aspects of the Chinese economy in ten chapters, using examples from a particular city or region. The book will walk the reader through the Chinese economic landscape, the economy’s strengths and weaknesses, opportunities and threats. Most people world-over have a single dimensional understanding of China as a country with cheap labour-driven manufacturing and exports. This book will enable a multi-dimensional understanding of China as a country which unleashed its economic growth through a cleverly driven strategy of inviting foreign investments to leverage on a supply of cheap land and labour, while encouraging domestic enterprises to become big and absorb foreign technologies. A country that is now transitioning from an old investment heavy, export driven growth model to one driven by higher value addition in manufacturing, services and a strong domestic demand. The book will help the readers understand what is happening in present day China, while realistically helping them develop their own insights into the Chinese miracle and its future. Anyone reading this simple tale of China told by an Indian civil servant will soon feel competent to answer seemingly complex questions on the Chinese economy, in an objective and simple manner. I can surely promise that on this journey for the readers! How does Beijing drive extraordinary models of growth? How did infrastructure drive China to achieve dizzying heights of growth? Where is China today in terms of financial liberalization? Why does the ‘factory of the world’ need reform today? What attracts multinational corporations to China? How do Chinese cities promote culture and tourism? How does strategic Chinese outbound investment push local Chinese business interests? What is the status of health systems in China? What is China’s secret growth mantra? What are the country’s present economic vulnerabilities? How is China boosting its agriculture to support a billion plus population on limited arable land? Can China really look for growth opportunities while correcting its regional imbalances? Are big-ticket infrastructure projects and urbanization critical for China’s economic growth? What peculiar growth and development strategy helped China raise hundreds of millions above poverty line?